Promise Land Resort is 9 1/2 miles off of Highway 5. Coming from the North on Highway 5 go approx. 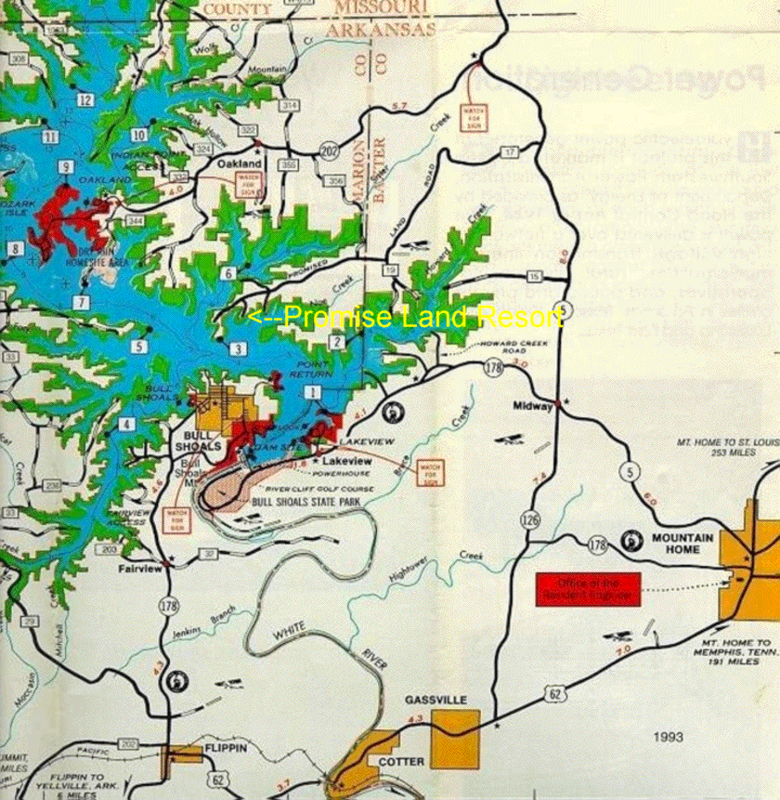 2 1/2 miles across the Arkansas border to County Road 17 (Promise Land Road), you will see a "Promise Land Area Sign". Turn right and follow the signs to Promise Land Resort. At each intersection you will see Resort signs with arrows. Coming from the South on Highway 5 go approx. 5 1/2 miles North of Midway to County Road 17 (Promise Land Road), you will see a "Promise Land Area Sign". Turn left and follow the signs to Promise Land Resort. At each intersection you will see Resort signs with arrows. Please be careful using GPS to get here, our experience has been that it does not give you the best route. Call us and we will be happy to give directions. Using MapQuest, Google and Yahoo for directions coming from the north or south, does not give you the best route, call us and we will be happy to help. Turn left off highway 178 just before the dam on the Lakeview side. The trail is semi-difficult for the average biker. It is 5 to 6 feet wide and almost 4 miles long. It runs along the White River, turns and goes uphill toward highway 178. Then it turns to go downhill and splits into two paths, one easy and one more difficult. You may bring your own bike or rent one near the trail access point. The trail may be ridden in a clock-wise or counter clock-wise direction. It is also open for hiking but closed to motorized vehicles.